I have been typing for months, now is your turn. This column is opened for you to share out your thinking, ideas, opinions and suggestions to audience. As we live in Information age, people are more opened to share their view on what they see and how they feel, especially over the blogs nowadays. Perhaps over here your voice will be heard by the respective parties. As the result, creates positive influence power to make things better. I believed people who have authorities are also reading my blog. Hopefully your message will be pickup and turned in to reality. Thus, let’s make thing happen by sending me emails, I will post it in ShareYourThought section for the public reading. That's a good idea!I think your blog will be known by many many people.. I think everyone have their own hobby. Some like sport, some like to collect stamp's or money n coin's. 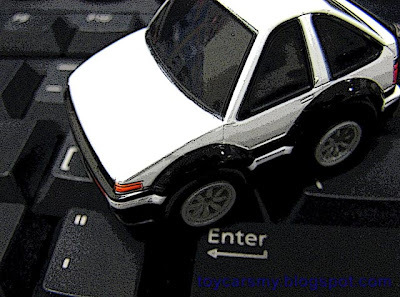 For me, I having this toy car collecting hobby start back in 2001 and is still growing. I believe this toy car collecting is a good hobby. Because it help to keeping us ocupy or something to look for during our normal weekend shopping with our spouse or our children. It keep us motivated to spent time with them. If I(man) did't collecting toy car, I really have no good reason for me to go to shopping mall. Before this hobby, I just can do window shopping at AV dept, camera dept, sport dept and all this department every things is very expensive. Not like toy car just few Ringgit's. Now, everytime I have half a chance to shop or visit a new mall local or outstation I'll go to it's toy section and look for new and old car's to add into my collection. Hope you enjoy this hobby as muc as I am. I was surfing thru the web and found your great website. I am pretty impressed with the set up and I believe you are quite an experience online business person yourself. I was wondering if we could exchange our links (via html code) between our sites. At the moment I am having approximately 600 unique visitors per month. I am now in the process of ramping it up to 3,000 visitors a month. Our marketing activities cover online and offline methods. I am pretty sure myself that your visitors volume are way better than mine. Anyway, kindly point your browser to http://repairthatpcfast.blogspot.com if you wish to know more about my site. At the end of the day if you're able to agree on this proposal, I hope that both our business will be further improved by this exchange of visitors. I can be contacted at repairthatpcfast@gmail.com or via personal mobile at 019-3552542 if you need to directly talk to me. I,m a collector from Canada and I collect any manufacurer die cast , my favourites are : Hongwell, Brekina, Minichamps, Herpa, Busch, Wiking, Motormax,JL, Maisto, Kinsmart, Welly, Tomica, Malibu Intl., Schuco, especially small scale , 1/72, HO, 1/64. canada is not a big die cast market like USA, Germany or Hong Kong, but you can find nice models from USA : HOt Wheels, MB, Johnny Lighting, an d the new Green Light looks like JL, but very detailed and finished cars. I like very much your green Real Toy VW Classic Beetle , because I start to collect a special section with my favorite car ever : the VW Beetle !!!! and I collect everything with Beetle old one: die casts, pins, books, DVDs, key chains, objects, etc. I was wonder, how can I have 2-3 green VW Real Toy ? Here, in Canada, you can find a lot of MB, Hot Wheels, JL ( with promo sales - only $ 1.50 CDN !!! ), from Wal Mart . Toys R Us is only OK, with a lot of HOt Wheels, I just purchased for my sons collection the new 2010 Mustang, nicely detailed, blue and a police Ford Fusion, a blue one and a black one., The 250 GTO, red and black and I will buy some 1/43 Ferraris excelent detailed, sp. edition, when I will have money, because of the price, 8-10 bucks, a little bit high !! !but I'm not a big fan of Ferrari. Hot Wheels is coming with new Mustangs, Nissan Skyline, Datsun, Chevy Camaro, Dodge, at this time.